Are you an introvert? I’m willing to bet the answer is ‘yes’ if you’ve found your way to this post. And I’m also willing to bet you’re wondering about whether introverts have the chops to be leaders. After all, most leadership seems to come from loud, confident people who rise through the ranks as a result of their gregarious natures. Well, luckily that’s not always true. There are plenty of introverted leaders staking their claim, and this week’s show is going to dive into why they are incredibly powerful to have around. 00:00 – 2:00: Welcome and Introduction! 9:26 – 12:57: How to be a leader without wearing yourself down. 12:57 – 15:48: Influence and boundaries. 15:48 – 22:18: Why the world needs both introverted and extroverted leaders. 22:18 – 28:30: Relating to a leader. 28:30 – 35:38: How to use introversion or extroversion in your messaging. 35:38 – 39:58: Wrap up and Leader Up Community! Let’s start by getting some definitions out of the way. When we say introvert we are referring to someone who gains energy when they are less stimulated. That means being around fewer people, less noise, and in a generally more peaceful environment. What it doesn’t mean is that introverts are, by nature, hermits. Some may have hermit-like tendencies (*raises hand*), but others enjoy a night out as much as anyone else. They just might need a few nights in afterwards. Extroversion, on the other hand, happens when all of that external stuff (socialization, noise, exciting environments) adds to your energy banks. If you’re an extrovert you probably can only handle “staying in” for so long before you need to get outta the house. Important Point: Introversion is similar to HSP (highly sensitive person), but not necessarily the same. An HSP can be an introvert or an extrovert, and is often mislabeled. I recommend heading here to read up on the nuances. At the end of the day, whether you’re an introvert or an extrovert, it’s not black and white. Everyone is at a different place on the spectrum, and everyone handles stimulation (or a lack thereof) differently. With the definitions out of the way, let’s talk leadership. Often, introverts can be passed up for leadership roles within companies because they’re, well, quiet (this is a broad generalization, of course). But in truth, introverts make wonderful leaders. They tend to be naturally insightful, thoughtful, and open to new ideas. They’re flexible and listen well. All of these are great leadership qualities. First thing first: Trust your gut. You can read all the blog posts about introversion in the world, but at the end of the day you know your body best. Listen to your instincts and look for patterns. Start to figure out what amps you up and what exhausts you and what lands somewhere in the middle. Then, figure out how you most want to be present. For example, just because public speaking exhausts you, that doesn’t mean you’re banned from public speaking. I love leading public workshops, and I’m as introverted as they come. The only difference between me and the extrovert running a similar workshop is that after we’re done I’m going to head home for a nap. One of the key pieces of our thought leadership framework is influence. That can be a scary word, especially for the introvert who isn’t used to the spotlight. But to get our big ideas out to the world, we need influence. If we aren’t building an audience, our impact won’t grow. So when it comes to building your business and communicating with your audience, lean into your strengths. We run a regular livestream show because we know it’s what our energy levels can maintain. We keep a cap on the number of meetings we hold in a week. We set boundaries around our client load. Each of these decisions has allowed us to manage our energy levels, so that when we show up we can do so full force. We need more diversity in the ranks of leaders, not less. We need introverts and extroverts, creatives and strategists, the whimsical and the wild. There is no one definition of what a leader looks like, and that’s the beauty of it. As leaders, it is our job to rise up and create other leaders, and that takes diverse points of view, backgrounds, cultures, etc. Which brings up an important point. Initially, you may be drawn to work with (or follow) people who are similar to you. After all, they get you (right?). But I would challenge you to expose yourself to more diversity. Follow leaders who may be different from you and offer a fresh perspective. That’s where we grow. Whether you’re an introvert or an extrovert, leadership is about connection. Listen to others, share your ideas, and do the inner work that will allow you to be confident in who you are. People will relate to you and follow you. At the end of the day, you have a business to run, and that business needs clear messaging. So what does your message have to do with whether you’re an introvert or an extrovert? The message itself won’t necessarily change, but the type of content you produce can play to your strengths. You can gear your public facing content towards your energy levels. For example, if video is your jam and excites you… do the video thing. If you prefer writing, do that. But don’t be afraid to push yourself a little. I resisted interviews for a long time because they felt too “out there”. Now, they’re one of my favorite things to do. I need to schedule in some downtime afterwards, but they really do light me up. Action Items: Here’s what you can do right now (introvert or extrovert!) to step up as a leader. Don’t live in your “box”. Take note of your comfort zones and challenge yourself to stretch them. 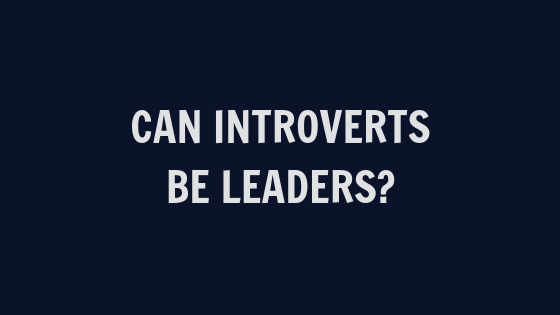 That’s Episode 20: Can Introverts be Leaders? 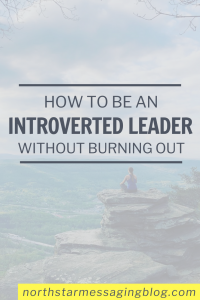 Tell us all about your experience as an introverted leader in the comments below. Catch the Leadership Forum when it goes live! Head on over to the Thought Leaders Think Tank on Facebook and request to join. Want access to additional trainings, a community of fellow leaders, and personalized support? Our leadership community is closed right now, but you can click here to join the waitlist.